Today, Carnival Cruise Line revealed the exclusive new features being designed specifically for Australia’s newest cruise ship from 2019, Carnival Splendor, including two thrilling waterslides and two splash parks, plus an expansive RedFrog Pub and a more spacious adults-only Serenity™ Retreat. 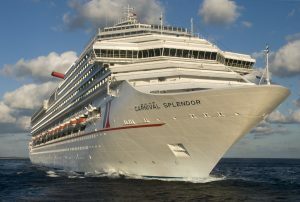 Set to call Sydney home as of December 2019, Carnival Splendor will be the newest and largest ship homeported year-round in Australia, the length of three football fields and an impressive 14 decks high. The ship will have a capacity of 3,700 guests. Building on Carnival’s reputation for jaw-dropping waterslides, Carnival Splendor’s current plans take things to a whole new level with a waterpark featuring two thrill slides for the big kids, and mini-racer slides plus the much-loved Tipping Bucket for the little ones. The first draft for the Green and Gold waterpark includes a Green Thrill slide that takes Green Thunder to the next level. Set to raise the bar and offer a spectacular experience, these new jaw-dropping waterslides will leave guests feeling exhilarated. Carnival Splendor will have a second junior splash zone protected from the wind and offering fun for little ones. In addition to the water adventures on board, Splendor will be upgraded with the signature FunShip 2.0 features that have made the Carnival fleet a favourite among Aussie cruisers in recent years. An all new expansive RedFrog Pub, the perfect setting for Music Manila and its dedicated fans to rock all night long. RedFrog Rum Bar and Blue Iguana Tequila Bar will be serving up tasty cocktails and cold beer poolside. With Aussies loving some chill-out time, Carnival Splendor will offer a spacious aft deck Serenity Retreat area, an adults-only retreat with the right laid back vibe. A perennial favourite for Aussie guests, Guy’s Burger joint will be offering up Guy Fieri’s tasty burgers with his signature Donkey Sauce. For those who love a handcrafted cocktail, Alchemy Bar on Splendor will be the place to be. Active types will appreciate the two pools, two spas and a sports deck with mini golf, running track and sports courts. The spa themed, Cloud Nine accommodation, including complimentary access to the spacious Cloud 9 Spa’s thermal suite and thalassotherapy pool for those after some R&R. More features of Carnival Splendor will be unveiled in early 2019.